FREE to Dayton History Members! 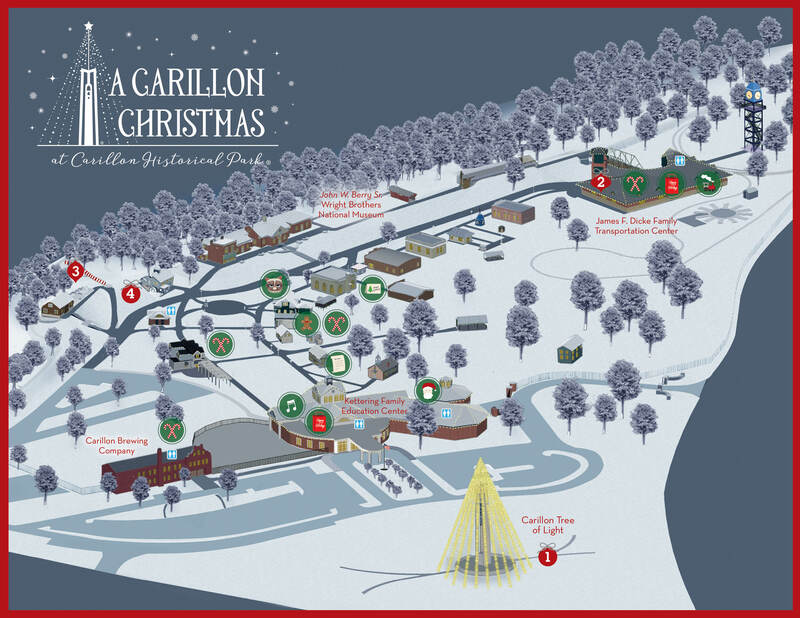 Join us for A Carillon Christmas to see Carillon Historical Park’s 65-acre campus transformed into a winter wonderland of sparkle, magic, and holiday cheer! A Carillon Christmas will begin on November 21st with the illumination of the Carillon Tree of Light, Ohio’s tallest tree of light. Join us as this remarkable light display dazzles the Dayton skyline for its fourth year. The lighting will kick off a month of holiday festivities at Carillon Historical Park! The Carillon Tree of Light stands at 200 feet, affixed to the top of 151 foot tall Deeds Carillon that was dedicated in 1942 by Col. Edward A. and Mrs. Edith Walton Deeds as a gift to the Dayton community. The first concert played on the Carillon took place on Christmas Eve, 1941, just weeks after the attack on Pearl Harbor. The Tree consists of over 20,000 light bulbs on nearly 100 separate strands that come to life each night at dusk and blaze through until dawn for the entire month of December. The Tree of Light was made possible with the support of Connie and John Taylor. Join us for these special programs and watch as Carillon Park comes alive with your favorite holiday traditions! All locations have been marked with a holiday icon on your map and they are open between 5:00pm and 9:00pm, Sunday through Thursday, and 5:00pm to 10:00pm on Friday and Saturday. Did you know that Dayton was the toy manufacturing capital of the United States in the 1920s? Visit Santa in the Heritage Center, in front of the Dr. Richard and Dorothy Cummings Collection of Toys made in Dayton. Bring your own camera to take a complimentary picture. Write a letter to Santa in Newcom Tavern (Est. 1796), Dayton’s oldest standing structure. It contains the original Van Cleve cabinet which served as Dayton’s first post office. Make sure to give your letter to the postmaster or postmistress to send to the North Pole! Enjoy the delightful music of our very own Victorian carolers as they spread holiday cheer. Caroling is a tradition with roots in the Middle Ages, but it became popular during Christmas in the 19th century. Learn about historic hearth cooking with our costumed interpreters. Purchase a homemade gingerbread cookie and a cone of roasted chestnuts! Enjoy a Christmas-themed Puppet Show based on The Tailor of Gloucester (1903) by Beatrix Potter in the Wright Brothers Aviation Center. This tale, from the author of Peter Rabbit, was published only a few months prior to December 17, 1903, when the Wright brothers achieved First Flight in Kitty Hawk, North Carolina. Visit our Print Shop, the only complete 1930s letterpress job shop operating in a museum in the nation. The equipment in this shop was typical during an era when Dayton was home to 77 printing companies. Take a ride on a magical train through a winter wonderland of lights reminiscent of a trip to the North Pole. (Cost: $1 per person, per ride). Visit our Train Store to purchase something to remember your experience! Whether you are looking for something Dayton related or holiday-themed, you’ve come to the right place for Christmas shopping! Visit our Museum Store in the Kettering Family Education Center and the James F. Dicke Transportation Center, to find the perfect gift! Are you looking for a full meal? Visit the Carillon Brewing Co. for delicious fare, including our own historically-crafted beer. Deeds Carillon has again been crowned with 20,000 light bulbs to create the marvelous Tree of Light, a spectacular addition to the Dayton skyline. Enjoy a Christmas model train presented by the Miami Valley Garden Railway Society. Descend through an epic lighting display of candy cane trees. Make sure you enjoy the spectacular view from the top of the Moraine. Enjoy the twinkling lights of a miniature Christmas village through the window of our replica Gristmill. Specialty Christmas concessions are available daily at different locations throughout Carillon Park during A Carillon Christmas, November 21st through December 30th. Of course, the Carillon Brewing Co. is serving food every day from 11:00am to 9:00pm all year long! Enjoy Soft Pretzels, Peppermint Swirls, Hot Dogs, Hard Cider, Beer & More! Counter service and outdoor seating available! Fresh Popcorn, Hot Cocoa, & More! Grab a snack and drink to take with you as you walk through the park. Gingerbread Cookies, Hot Cider, & Hot Fresh Chestnuts! All prepared before your eyes using historic cooking techniques! Looking for a full-service dinner? Visit the Carillon Brewing Co., located right outside the main entrance to Carillon Historical Park. To learn more about our house brewed beers and to see our full menu, please visit www.carillonbrewingco.org. Carillon Historical Park is a 65-acre campus with indoor and outdoor exhibits. Keep an eye on the weather to plan your wardrobe! During A Carillon Christmas, carry-in coolers, food items, or drinks are not permitted. We will have a variety of holiday treats available at our vending stations or you can dine at the Carillon Brewing Co.! Can I come to the Park before 5:00pm? Yes! Carillon Historical Park will remain open for our regular day-time hours beginning at 9:30am Monday through Saturday and 12:00pm on Sunday. You are welcome to enjoy the whole day at the Park, including A Carillon Christmas, until 10pm. You will not need to leave and re-enter the park due to A Carillon Christmas. Admission prices for A Carillon Christmas are the same as our regular admission. Where can I park? How much does it cost? FREE parking is available on the Carillon Historical Park campus. When do lights and holiday programming start? All A Carillon Christmas programming will begin at 5:00pm, excluding November 21 when it will begin following the 6:00pm illumination of the Carillon Tree of Light. Which night(s) have the most activities? All programs will remain consistent throughout the entire month. You will be able to participate in the same holiday activities every day of the week. Several of our food and activity locations require cash. There is an ATM located in the lobby of the Kettering Family Education Center, but it is advised that you bring some cash for food and activity purchases. We do accept credit/debit cards in the Museum Store for the purchase of admissions, memberships, and all store merchandise, and at Culp’s Christmas Café for food purchases.